The Resurrection Egg, also known as Transformation Egg, is made of yellow gold, rock crystal, rose-cut diamonds, pearls, brilliant diamonds, red, green, white, blue and black enamel. In the form of a monstrance, the Resurrection Egg is one of Fabergé's masterpieces; exquisitely made in the manner of the Italian Renaissance, it is essentially a jewel. The figure of Christ depicted standing above the tomb which is flanked by two kneeling angels, each figure naturalistically enameled, the robes enameled white, raised on an oval base bordered by diamonds, the underside with radiating flutes alternately enameled white and translucent strawberry red. 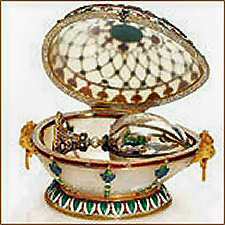 The whole contained within a rock crystal egg-form shell with a vertical diamond-set band raised on a domed quatrefoil foot enameled with multicolored scrolls in Renaissance style and with diamond-set ribbons and mounted with four pearls. The pearl stem with a border of diamonds is marked with the Cyrillic initials of Fabergé and assay mark of 56 standard for 14 karat gold. The Resurrection Egg bears the early hallmark of head workmaster Michael Perkhin and the assay marks of St. Petersburg before 1899, a combination of marks dating it to between 1884 and about 1894. The Egg is not inscribed with a Fabergé inventory number. The Resurrection Egg has, until recently, been unanimously considered as one of the Eggs given by Tsar Alexander III to his wife, Maria Feodorovna. It was exhibited as such at various exhibitions including the Victoria and Albert exhibition in 1977. Recent research however, by Tatiana Fabergé, Fabergé-expert and great-granddaughter of Karl Fabergé, proved that there is no place for this Egg in the list of Imperial Eggs. However, a highly intriguing hypothesis has recently been advanced by Christopher Forbes, namely that the Resurrection Egg is in fact the surprise originally contained in the 1894 Renaissance Egg. This would account for its being shown in the same showcase at the 1902 exhibition, where surprises have been separated from their eggs. Moreover, style and coloring of both objects are virtually identical and the size of the Resurrection Egg perfectly fits the curvature of the egg. The invoice of the Renaissance Egg mentions a pearl, which is not accounted for unless it was part of the surprise. This work of art does not bear an inventory number, which speaks in favor of an Imperial presentation, a hypothesis which would explain why the Resurrection Egg is not included in the generally accepted list of Imperial eggs. 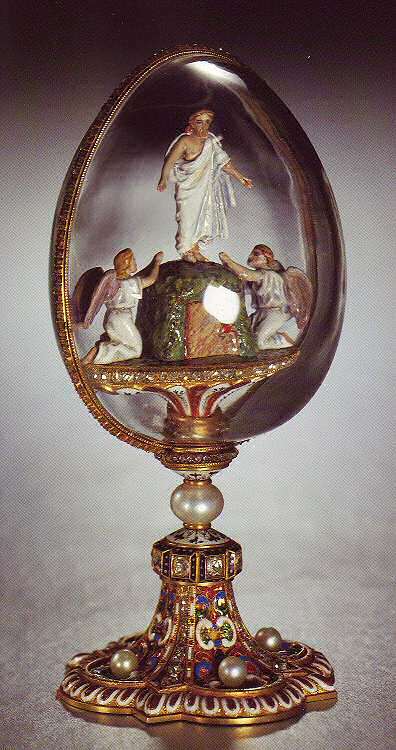 The Resurrection Egg is the only Fabergé Egg, that refers to Christian Easter, the resurrection of Christ. In 1922 bought by a London dealer, probably from Russian officials of the Antikvariat. 1934 sold by Christie's, London to a Mr. R. Suenson-Taylor, UK. 1955 Owned by Lord Grantchester, the former Sir Alfred Suenson-Taylor. 1962 - 1976 owned by Mamie Suenson-Taylor, Lady Grantchester. 1976 bought by A La Vieille Russie, New York, estate Lord and Lady Grantchester who died within months of each other. 1978 A La Vieille Russie, New York, negotiated private sale to the Forbes Magazine Collection, New York, together with the 1885 Imperial First Hen Egg. February 2004 sold by the Forbes' family to the Vekselberg Foundation/The Link of Times-Collection, Russia.